Layoffs on Wall Street surged in January to the highest monthly level seen since September of 2018, while new hiring dipped sharply following a strong December gain reflecting an overall weak outlook as bank executives continue to trim expenses through the use of automation. 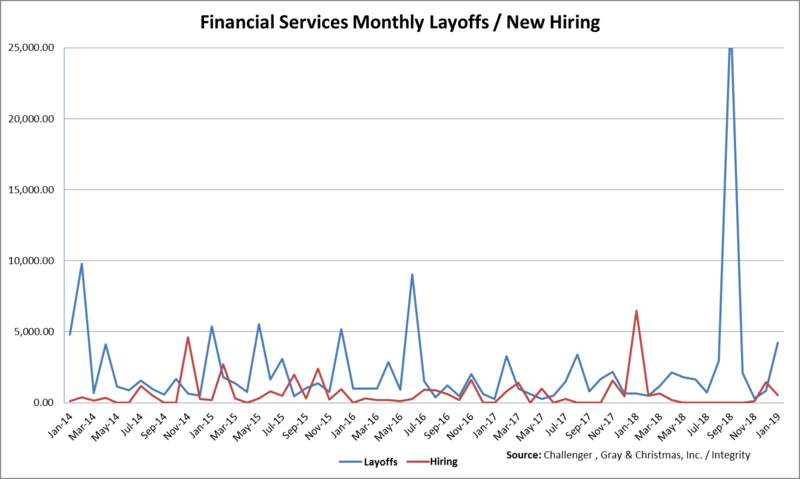 According to the January Challenger, Gray & Christmas monthly Job Cuts Report released last week, the financial services industry saw planned layoffs surge 399% to 4,230 layoffs from 848 layoffs announced in December. The January layoff total marks the highest layoff level seen since September of 2018 when 27,343 layoffs were announced. The January layoff figure also represents a 564% rise from the 637 layoffs reported during January of last year. New hiring in January dipped sharply as financial services firms announced 520 new jobs were available compared to the unusually high level of 1,436 new jobs announced in December. The December new jobs total was the highest monthly total since the 6,500 new jobs announced in January 2018. As you can see from the above chart, net employment (new hiring less layoffs) dropped sharply in January (-3,710 jobs) following a month when net employment actually grew (+588 jobs). This weak jobs performance is consistent with the fragile employment outlook we saw in the industry for most of 2018. Net employment only rose in two months during 2018 – in January and December. This decrease in net employment during January suggests that uncertain market conditions have prompted many investment banks to continue “right sizing” their workforces. Last month, Boston-based State Street Corp announced that it was cutting 1,500 jobs or 15% of its senior management ranks, in a move to cut costs. Ronald O’Hanley, who took over as CEO of the money-management and custody-bank last month, is pushing to reduce expenses, automate more functions, and simplify the organizational structure. Blackrock, the world’s largest asset manager, also announced last month that it would dismiss 3% of its workforce or approximately 500 employees marking the largest headcount reduction for the asset manager since 2016. This move came after Blackrock reported 3rd Qtr earnings in October, which revealed that long term asset inflows were at the lowest point since 2016. The rise in layoffs and drop in new hiring data in January points to a fragile employment picture for Wall Street firms, as many financial industry executives continue to try to drive efficiency and lower costs given a mixed outlook for earnings. As far as the research business goes, we suspect most investment banks and independent research firms will continue to fill open positions, particularly in high demand sectors including technology and healthcare. However, we doubt most firms will try to grow the number of analysts or salespeople on staff, particularly given the negative impact that MiFID II has had on the sell-side and independent research businesses.